EPDM is a waterproof type of rubber, perfectly suited to cover roofs. Although it is not the cheapest roof covering, it is one of the best materials for flat roofs. EPDM has a very long lifespan and little maintenance is required. In this article, you can read more on the advantages, price and focus points of an EPDM roofing. + Long lifespan: a rubber roofing will last 40 to 50 years on average. + Does not tear apart: because of its specific composition (with elastomers), EPDM is a very elastic material. The material will maintain its elasticity in both hot and cold conditions. It won’t start cracking due to shrinkage- or expansion tensions in the roof. + No maintenance: this roofing does not require maintenance. If damage does occur, this is usually repairable with self-adhesive foil. 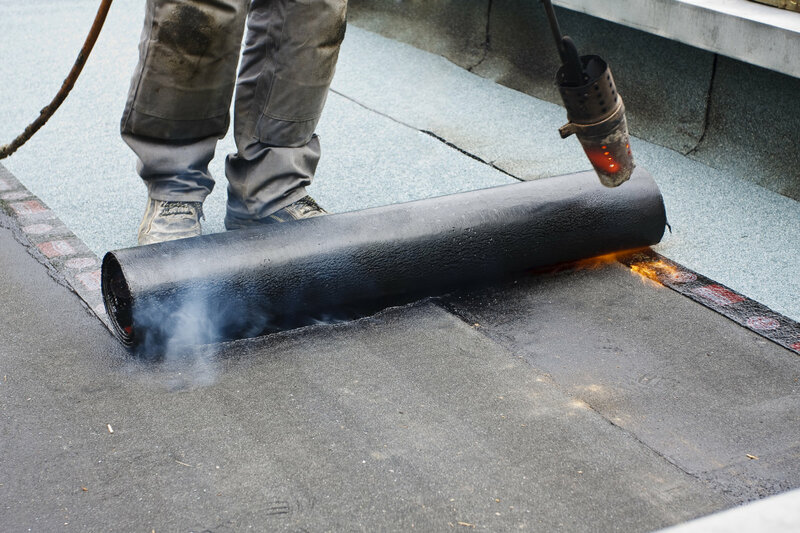 The EPDM roofing won’t crack any further, so damages will always remain small and superficial. + Remains walkable: thanks to the stability of EPDM, the roof remains walkable. Rubber for roofs won’t melt like bitumen. Neither will the material tear apart when it is walked upon during periods of frost. + Application on top of current roofing material: EPDM is suited for almost every roof type, although it is primarily used on flat roofs. 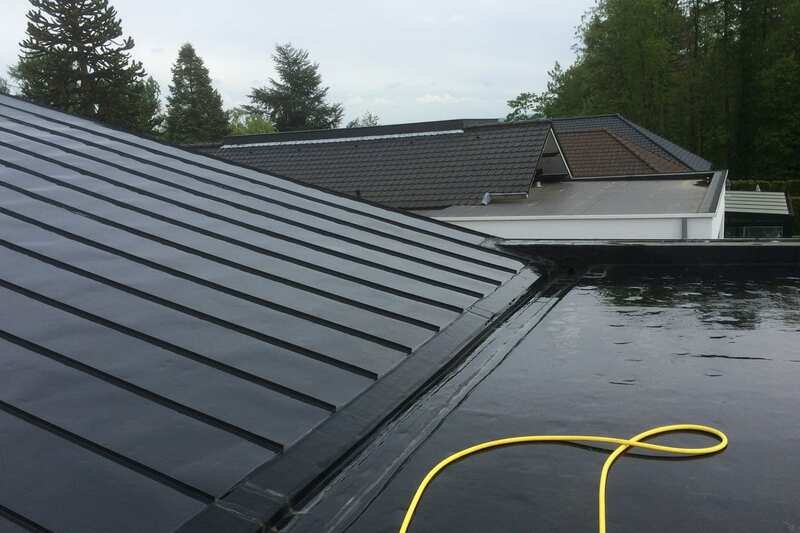 In most of the cases, this rubber roofing material can be applied on top of the existing roof covering. 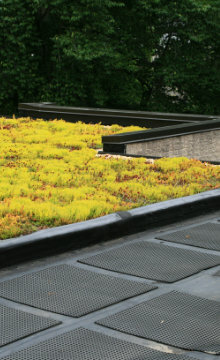 + Perfect base for green roofs: as EPDM is waterproof and resistant to roots, it is an ideal foundation for green roofs. In this way, you can create a more natural look than with synthetic roof rubber. The price for the installation of an EPDM roof depends on many factors, including the total surface of the roof, the type of roof and the type of rubber. Other work activities may influence the price as well. Sometimes, roof renovation is required before the new roofing can be put in place. One removes the old roof covering and eventually, the roof construction will have to be replaced. In other cases, an entire renovation like this won’t be necessary; roofers can install the rubber foil on top of the existing roofing. Anyway, EPDM is also fit for new-build construction projects. Installing an EPDM roofing costs about £45 per m² on average. When the old roofing material and the roof construction need to be removed, the total cost will be much higher. Roof insulation will entail extra costs as well. So, prices strongly vary depending on the work activities. For this reason, it is recommended to request price quotes from different roofers. Via our quote page, you can receive customised and non-binding quotes from recognised roofers for free. By doing so, you can easily compare price proposals and choose the most interesting option. Click here to go to the quotation page. How is EPDM rubber roofing installed? Mostly, roofers make use of a big customised rubber roof membrane. If multiple pieces are used, these are attached next to each other with an overlap. The seam is glued tightly onto the roof, so the whole remains waterproof. The thickness of the EPDM membrane usually varies from 1 to 1.5 millimetre. 1) Glue EPDM: the membrane is glued onto the underlying layer. Note that this foundation should be suited for adhesion. You can, for example, combine the new roofing with roof insulation. In this case, it might be possible to glue the membrane directly onto the insulation boards. Otherwise, an intermediate layer must be provided. 2) EPDM with layer of ballast: with this method, the EPDM membrane(s) lie(s) loosely on the roof. They stay in place thanks to a ballast layer like gravel. The advantage of this technique is the quick installation. 3) Mechanical application: it is also possible to secure the membrane mechanically. This can either happen on top of the roof covering, or up form below. – Slope of the roof: does water often remain on the roof? This means something is wrong with the slope of the roof. The contractor can fix this, although this involves extra costs. – Insulation: in order to limit heat losses, roof insulation is a smart investment. When you opt for EPDM roofing, you can choose to install a layer of insulation material first. Rigid insulation boards are often chosen to insulate the roof from the outside. As said before, sometimes one glues the EPDM membrane straight onto these boards. In other situations, an extra intermediate layer will be required. Discover more about the types of roof insulation. – Method of installation: there are different techniques to install the rubber roof membrane. The cost of the work will be determined by the choice of method as well. Take into account additional costs, for example, when the EPDM rubber is installed by means of a ballast layer. – Warranty: inform about the possibilities regarding warranty. You can possibly agree upon a period of warranty with the contractor (for example a period of ten years). Most of the firms will give you this warranty. Do pay attention to the terms and conditions however, so you exactly know your rights. Who will, for example, pay for the damage a leak has caused? And what about the insured value? Are you looking for a professional to install a rubber roofing? Via our quote service, you can request free and noncommittal quotes from specialised roofers. Click here to receive customised prices.